On St. Patrick’s Day we’re all Irish – and we want to celebrate. 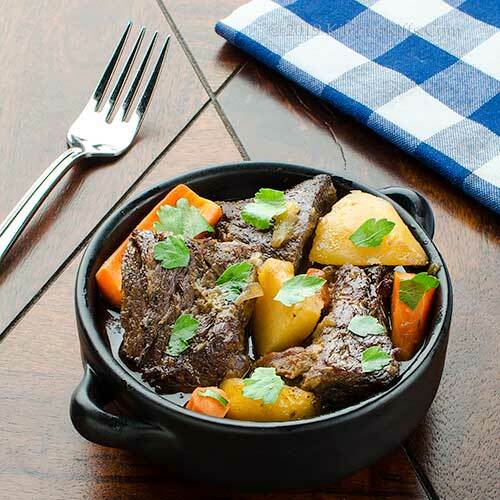 So how about some hearty Guinness Beef Stew? It’s a great dish for entertaining. Because you braise the beef slowly, most of the prep work will be done hours before you need to serve. You can even make this dish a day ahead, then reheat it – the flavor will only get better. In fact, it will have more flavor than you can shake a shillelagh at. This dish is made like any stew, except you’ll use Guinness to replace some of the liquid. Prep time for this recipe is about half an hour. Cooking time adds 2 to 3 hours, most of it unattended. Leftovers keep well for a day or two if refrigerated in an airtight container (in fact, we often make this a day before we want to serve it). You can also freeze the leftovers for a month or two. This recipe yields enough for about 8 servings. Using paper towels (or a kitchen towel), pat the beef until it’s totally dry. Cut the beef into largish chunks of about 2 to 3 inches square (or smaller if you prefer). Season to taste with salt. Heat a large frying pan. When it’s hot, add enough oil to thinly coat the bottom of the pan. Once the oil is heated (it’ll shimmer; about 15 seconds), add as many chunks of beef as will comfortably fit in the pan (don’t crowd the pieces – you may have to brown the beef in 2 or more batches; see Notes). Cook the beef until the first side is browned (about 4 minutes), then turn the chunks and brown the other side. When the beef chunks are browned, remove them to a plate lined with a paper towel. After all the beef is browned, use a paper towel to wipe off any oil remaining in the pan. Then add about a cup of beef stock and deglaze the pan (scrape up any bits of meat that may have stuck to the bottom). Set the frying pan (with the beef stock) aside. Preheat the oven to 325 degrees F. Peel the onion and cut it into ½ inch dice. Set aside. Wash and peel the celery, then cut it into pieces of about ½ inch. Set aside. Peel the carrots, trim their ends, then cut them into rounds (or half rounds) of 1 to 3 inches (whatever size you prefer). Set aside. Wash the potatoes, peel them, and cut them into chunks of an inch or two. Set aside. Place a large Dutch oven (or other wide-bottomed cooking pot) on medium stovetop heat. When the pot is heated, add the oil. When the oil is hot (it’ll shimmer; about 15 seconds), add the chopped onion. Season to taste with salt. Sauté for 2 minutes, then add the chopped celery and carrots. Add another dash of salt, then sauté for an additional 5 minutes. Add the chopped garlic and cook for 1 minute. Then add the tomato paste and thyme. Cook – stirring often – for 2 minutes. Add the browned beef pieces and the potato chunks to the cooking pot. Add the Guinness and the beef stock (along with the beef stock from deglazing in Step 2). Bring the mixture to a simmer. Cover the cooking pot and place it in the oven. Cook for 2 to 3 hours, until the beef is tender. 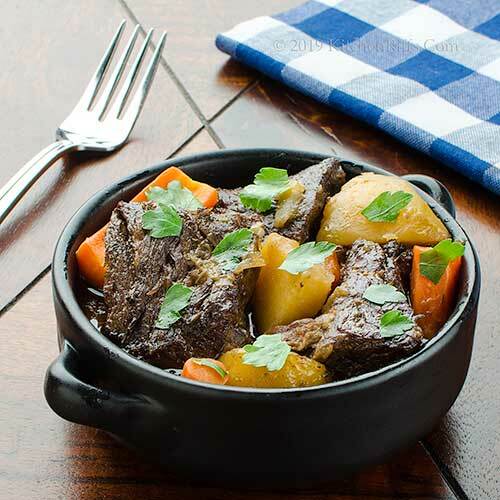 Remove the beef stew from the oven. Taste, then adjust the seasoning if necessary. If the sauce seems bitter to you, stir in the brown sugar. If you want to thicken the sauce, mix the corn starch with an equal amount of cold water (or Guinness! ); stir the corn-starch mixture into the pot of stew. Serve. Garnish with chopped parsley, if desired. As is the case with many stews, you can easily adjust ingredient quantities to taste in this dish. Don’t try to fit too many pieces of beef in the frying pan at once. If you do, the chunks will steam instead of browning. We’ve seen recipes that add half the Guinness to the cooking pot at the beginning and the rest shortly before serving. The idea is to give the stew more “Guinness” taste (the flavor of stout does mellow quite a bit as it cooks). We don’t bother with this. Instead, we just serve the stew with Guinness as a side beverage. Full flavor! You can leave out the chunked potatoes if you like and instead serve the stew over a bed of mashed potatoes. In that case, we suggest that you definitely thicken the sauce with corn starch (Step 11). Chuck roast has good flavor and it’s the cut we like to use for braising. But any cut of beef that benefits from long, slow cooking works in this dish (such as top round). BTW, it’s cheaper to cut up the meat yourself rather than buying pre-cut “stew meat” at your butcher’s. Cutting up the meat yourself also means you can cut it to the size you prefer. We like to use large chunks of beef in a dish like this – we think they make for a more attractive serving size. 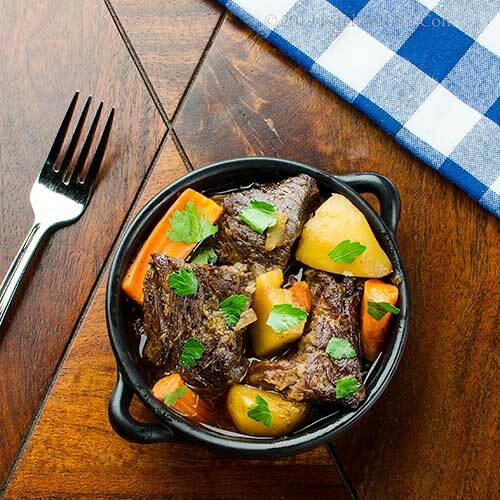 After braising, the pieces will be tender enough that you don’t need a knife to cut them – a fork will be sufficient. Some cooks like to dredge the beef chunks in flour before browning. We don’t, but it does add some extra flavor, and of course helps thicken the sauce. You could substitute another brand of stout for Guinness if you want. But Guinness is so good that it’s the only brand of stout we ever buy. We use kosher salt for cooking. It’s less salty by volume than regular table salt (the crystals are larger, so they pack a measure less tightly). If using regular table salt, start with about half as much as we suggest. But always season to your taste, not ours. When cooking a recipe like this one, we always salt the veggies at the beginning. By salting early, we find that we often end up using much less salt than if we add it after the dish is cooked. Want extra flavor? Try bacon. We sometimes brown a few slices of bacon, then use the fat to brown the meat and veggies (and then add the bacon to the dish). Salt pork would work too (simmer it in water for about 10 minutes first to draw out some of the salt; then dry it off and brown it). The crust that forms on the bottom of the pan when you brown meat (Step 2) has a lot of flavor. That’s why we call for deglazing the pan with liquid to release the crust (so you can add it to the dish). Should you eat this dish with a fork or a spoon? We vote for both! If you cut the meat into large chunks, as we suggest, you’ll definitely need a fork. But you’ll also want a spoon to slurp up all that lovely sauce. Of course, I’ll have to step in and finish the leftover Guinness when we make this. Ours is a rocky road to Dublin. No Irish here, but it doesn't matter because this looks and sounds delicious, and is on my to do list! You are so right about chuck roast, the flavor is delicious. I'll shake a shillelagh at the good flavor of this dish for sure! Thanks! Hi Pam, we DO have some Irish, but even if we didn't, we'd be Irish for St. Pat's Day. So we could have this. :-) Thanks for the comment. 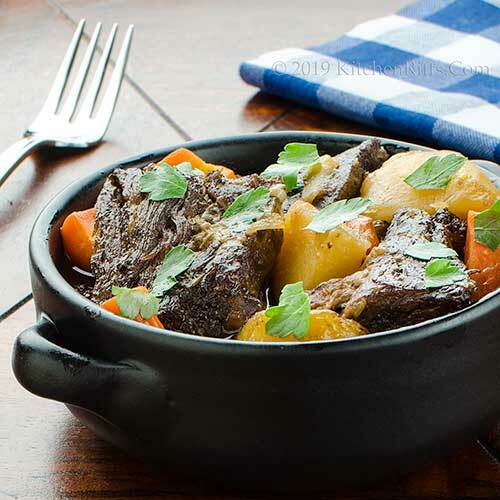 LOVE Guinness Beef Stew and it is so true it get's better the day after. Good idea to by a piece of meat and cut to the size you want. and bacon: YES! Yes, please! This looks heavenly, John. And finishing stews in the oven is a good way to go, I find. It surrounds the pot in a gentler heat, cooking everything more evenly than on the stovetop. Hi Evelyne, we didn't make this batch with bacon, but often do. Hard to resist. :-) Thanks for the comment. Hi Terry, we're big fans of braising in the oven -- so much easier. And, as you note, much easier to control the heat. Thanks for the comment. Reminds me of Carbonnade à la Flamande -- the Belgian beef & beer stew. A great idea wherever it comes from. Hi Mae, this is a very similar dish! And thanks for reminding me that I'm way overdue to make Carbonnade à la Flamande again. :-) Thanks for the comment. Just made some Guinness beef stew this week! Will have to try your version! Hi Ashley, it's such a good dish, isn't it? Thanks for the comment. I never could get into drinking Guiness although I like it when used in a recipe. Go figure. My son, on the other hand, is a bit of an aficionado and travels all over to taste craft beers and such. Hi Lydia, a lot of people find stout too hearty all by itself, but find it nice in a recipe (its flavor really mellows). We like it both ways! :-) Thanks for the comment. I never know what to make to celebrate St. Patrick's Day. This is such an awesome choice! I love how hearty and comforting it looks. Hi Laura, hard to go wrong with this dish! :-) Thanks for the comment. But that's the best part of cooking with Guinness. I always make sure to have some leftover! In any case, this stew is perfect to have another! Hi Abbe, drinking the leftovers definitely is the best reason to cook with Guinness. Or wine. :-) Thanks for the comment. The dark beer must have added so much more flavours to the stew. Looks absolutely mouthwatering, John. Hi Angie, it's definitely mouthwatering! :-) Thanks for the comment. Yum, sometimes I see a 'Guinness Meat Pie' being sold at my local market- I can just picture placing this stew inside a crown of puff pastry! A recipe sure to make the Leprechauns happy and those without a bowl of your stew "green with envy". I'm not going to be a shillelagh in the mud and get this cooking for Sunday. I like so many things about this recipe! First, the decision to serve the stew with the same beer that's in it - of course. Also, to cut the meat yourself, into big, manly chunks. I think it's not only more attractive, but it tastes better. I think that maybe it's because in larger pieces, more of the melted fat stays in the meat. (I do like to flour the chunks.) The only slightly divergent path I might take is that - although I love Guinness and love its tradition and even love the way they run the company - I live in a city full of microbrews, and there are some really interesting local stouts that are fun to explore. So good! This was a favorite to test and reshoot a couple of weeks ago - love a savory braised beef and those big chunks of veggies look great! Hi Fran, cut the meat into bite-size pieces and thicken the sauce, and cover it with pastry and I'll bet you're right that this is a similar dish! Never had a Guinness meat pie -- need to. :-) Thanks for the comment. Hi Ron, :-) I really hate being a shillelagh in the mud, don't you? :-) Thanks for the comment. Hi Jeff, you could easily substitute another beer -- and it doesn't even need to be stout. It'd have a different flavor profile, of course, but it'd be awesome. But do keep those big manly chunks of beef. :-) Thanks for the comment. Hi Judy, we like big chunks of veggies! Look great, and seem to retain a bit more character. To us, at least. :-) Thanks for the comment. Hi Natalia, stews are great, aren't they? Thanks for that kind comment. Oh yes! This sounds perfect for this time of year, Guinness would give such a fantastic flavour to the stew. John, this stew looks picture perfect, thanks to your proper browning of the beef and cutting everything in large chunks. Wish I could make this today! Hi Caroline, Guinness makes everything better. :-) Thanks for the comment. Hi Jean, we really like big chunks of meat -- look great, and I think they cook better (remain moist and don't dry out). Thanks for the comment. What a wonderful dinner recipe! This is a perfect one-pot dish to take to my daughter while she recovers from surgery. Hi Deb, hope your daughter recovers quickly! This will help. :-) Thanks for the comment. Hi Rocquie, yup, beef stew is terrific, isn't it? So homey and comforting! Thanks for the comment. I am always in for a delicious stew! Somehow I have it in my mind as warm and homey type of meal, one that brings family together! Well, John, I just learned what a shillelagh is - and I'm part Irish! Don't know how I missed that one! This stew looks delicious. Love a hearty meat and potatoes meal! Hi Katerina, this dish is perfect for what you want! :-) Thanks for the comment. Hi Kelly, always fun to learn new things! And to try this dish. :-) thanks for the comment. Adding Guinness to the stew sounds wonderful. It's like the Irish version of Beef Bourguignon. Hi Gerlinde, pretty similar! :-) Thanks for the comment. Just what we need on this weekend as the snow is coming down. Love the deep flavors the Guinness brings to this stew. Very cozy meal. Hi Sherry, KR works fine! :-) And your summer has been awful this year -- cooler weather must be SO welcome. And a good excuse to make this stew! Thanks for the ocmment. Hi Bobbi, still having snow? Jeez -- long winter for you. Us, too, but it's been warmer lately. Not so warm, though, that Guinness Meat Stew isn't welcome! Thanks for the comment. Such a wonderful tradition for St. Patrick’s Day! I can’t have it this weekend but, as you and Mrs. KR suggest, why not have it anytime! Hi David, this really is a great dish any time of the year. :-) Thanks for the comment. Looks delicious and I like the addition of the Guinness. Happy St. Patrick's Day. I love Guinness stew. The stout lends such a wonderful, rich flavor to the meat. I used to make this back in Italy, where it was considered quite the "exotic" dish among my Italian friends. Always a big hit. Hi Amalia, who doesn't like Guinness? :-) Happy St. Pat's! And thanks for the comment. Hi Frank, we don't make this often, but it's always a big hit for us, too. Love this dish! Thanks for the comment. A nice alternative to the usual corned beef and cabbage. Happy St. Patrick's Day! Wow John, your stew sure looks better than the traditional corned beef...and yes, I agree with you, it tastes much better the next day...thanks for the recipe and I hope you are having a fabulous weekend! Hi Carolyn, we like corned beef, but sometimes you just want a change. :-Y Happy St. Patrick's Day, and thanks for the comment. Hi Juliana, we really like recipes we can make a day ahead. :-) Thanks for the comment. Hi Valentina, Guinness is terrific for cooking, isn't it? Such a nice ingredient! Happy St. Pat's, and thanks for the comment. Hi Greg, you should definitely go back for another. Unless you have a beef with that? :-) Thanks for the comment. I was totally NOT Irish this past St. Patrick's Day. I was "Mexican"... If we are going to go according to what was eaten. I had FAJITAS for Lunch, hahaha! Not very celebratory - LMFAO. Hi GiGi, I dunno, fajitas sound pretty celebratory to me. More for Cinco de Mayo, sure, but you're just ahead of the times. :-) Thanks for the comment. This is a delicious and hearty dish!! Perfect for a St Patrick's Day celebration, or any chilly day! Hi Amy, isn't this nice? We LOVE this dish! :-) Thanks for the comment. Hi Anne, the broth is great! :-) Thanks for the comment.